Dudley Street Neighborhood Initiative (DSNI), formed in 1984, is a community-based planning and organizing group in the low-income Dudley area of Roxbury, Boston, home to 24,000 residents. It has partnered with developers to create 300 new homes, a Town Common, gardens, urban agriculture, parks and playgrounds. An additional 300 housing units have been rehabilitated. DSNI is a membership organization, with 3,000 residents, businesses, non-profits and religious institutions members participating in modest, sliding-scale annual membership dues. DSNI focuses on three areas: community economic development, leadership development and collaboration, and youth opportunities and development. In the 1980s, the Roxbury area experienced massive disinvestment. Property owners burned houses to collect insurance, and Bostonians illegally dumped garbage and toxic waste in the neighborhood. A small family philanthropy, the Riley Foundation, initiated a series of community meetings to revitalize the area, and dedicated months of planning in advance of the first gathering. A neighborhood resident who attended, Che Madyun, asked the organizers, "How many of you live in this neighborhood?" The answer was none. She later reflected, "You always have people from downtown or somewhere else telling you what you need in your neighborhood." To the foundation's credit, Riley trustee Robert Holmes, Jr., one of the organizers of the initial iteration of DSNI, recognized that "we had made a mistake. We just had misjudged and really not thought through how we could put a neighborhood initiative together without including the residents—it was a rather incredible mistake." Despite Holmes' initial impression of Madyun as an "agitator," his foundation and the other agencies backed off their initial proposal and deferred to a new process led by residents to create an innovative governance structure. The new board's majority would be Roxbury residents, elected in an open vote every two years, representing the different ethnic groups, with other slots reserved for local businesses and area nonprofits. Door-knocking survey campaigns led to a realization that vacant lots were the primary problem among residents. The members of DSNI launched a campaign against dumping, then another to oppose City-led plans at redevelopment, which echoed the most troubling aspects of the notorious urban renewal initiatives that had displaced low-income residents and gentrified targeted areas. DSNI developed a bottom-up alternative planning document to the Boston's Redevelopment Authority's, and convinced the city to adopt it. The City accepted, and in 1987 it partnered with DSNI, using $134 million in public funds. 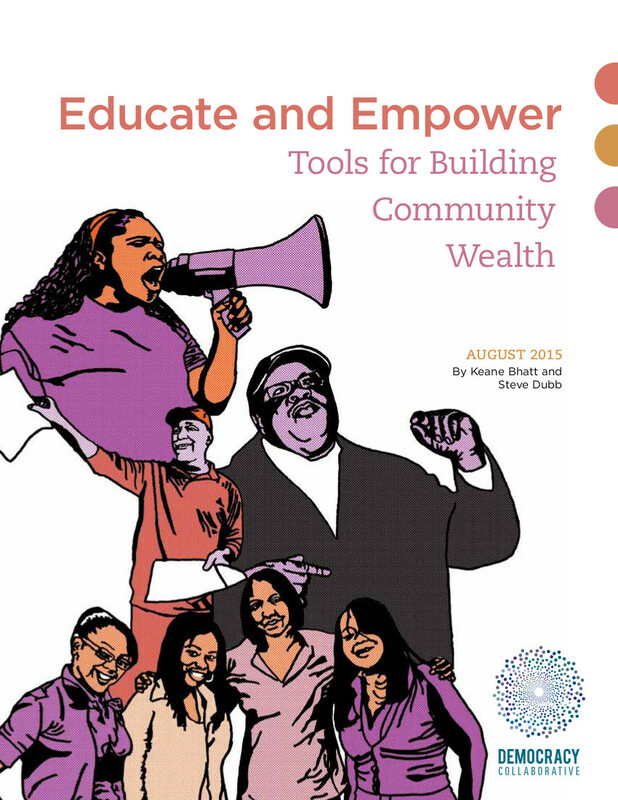 Learn more about the Dudley Street Neighborhood Initiative and other innovative community wealth building initiatives in our report Educate and Empower: Tools for Building Community Wealth. Bottom-up doesn't mean starting from scratch: From its outset, DSNI was never shy about recruiting outside consultants with aligned values to help chart out processes for community planning (consultants were not used to determine what course of action was needed). May Louie, former director of DSNI's Leadership & Capacity Building, notes that when DSNI created its training institute, a "wonderful consultant," Jennifer Henderson, facilitated the process of identifying core values by examining DSNI's documents, campaigns and actions. "When you did this, was it consistent with DSNI's values or was that wrong?" she would ask. She "pushed DSNI hard" and helped iron out stated values that inform DSNI's activities today. Consultants have been used for comprehensive planning, adult learning, geography visualization. Known as "the process people," DSNI has not felt that its strong commitment to community democracy, has prevented it from recruiting the technical expertise it needs. Inclusive Boards of Directors can be powerful educational opportunities: DSNI’s innovative 35-member board is elected through open voting with election literature offered to the entire neighborhood in three languages. Board training includes an orientation on DSNI’s mission, history, group processes, meeting design and facilitation, and collective leadership. Four positions are reserved for each of the four major demographic groups that reside in Dudley—Cape Verdeans, Latinos, African Americans, and whites—and four are reserved for youth members. This process provides not only strengthens community capacity, it serves as an exercise in community democracy and power. Investing in youth can result in enormous long-term benefits: DSNI has been wildly successful in developing leaders through enshrining youth participation in its values, programming, and institutional architecture. Four seats on the DSNI board of directors are reserved for youth aged 15–17, and youth membership dues are only five dollars annually. These investments pay off in terms of the long-term sustainability of community-change efforts as active young people remain in the neighborhood and work for its wellbeing. The benefits are also realized in helping to fill eventual staffing needs, as youth immersed in DSNI’s culture and trained in its processes join the organization as adults, including DSNI’s current Director of Real Estate, Innovation and Technology. DSNI’s longest-serving executive director, John Barros, became involved with DSNI at the age of 14 because his aunt was on the organization’s staff. Barros is now the City of Boston’s Chief of Economic Development. Leadership can be collective and fluid: DSNI's stated goal for its leaders is that they develop other leaders, not followers. Because of the institutionalized community process and energy around the governance system, old leaders are not holding on—"there is room for new voices to emerge and give back," says May Louie. Most of the election categories are contested and in every election between a quarter and third of the board is replaced. May Louie says this value extends to staff as well. A typical CDC may have the same founding director 35 years later, she says. In contrast, "we're on our 6th or 7th director—it's part of the organization changing to be what it needs to be, recognizing what that is, and a staff leader is who you need at the time. One of the qualities of John Barros's leadership was that it was always on the table. 'Tell me if it's time to leave. You owe that to community,' he'd say. He would open and invite the question." Invest over the long-term for real results: Louie notes that the president of a DSNI-sustaining partner foundation, stated publicly, "My biggest takeaway is how long this work takes." If you look at the past 30 years, says Louie, DSNI "got eminent domain, cleaned up garbage, created a land trust with permanently affordable housing, partnered with promise schools, allowed thousands of young people to come through a youth jobs collaborative that we convene, and there's still so much to do." Lack of public transportation, access to jobs, high unemployment and poverty in relationship to Boston, and failing schools are still issues DSNI is continuing to tackle. Lesson on replicability: Louie acknowledges that as far as she knows, DSNI is the only community organization that has successfully used eminent domain as a means for developing a community land trust. She doesn't think this should dissuade communities to attempt initiatives that seem implausible or ambitious. If an inclusive evaluation process determines that eminent domain or some other mechanism would be an appropriate solution, community groups should say, "We should go for it even if no one's ever done it." She adds, "Don't pre-restrict yourself. You would’ve gotten something anyway. So you want to push that limit, asking for the most you can even dream of now. Not that you need it, but if you can think of it, at least try."